Northants will attempt to sign Trent Copeland and Cameron White, but have given up on Rory Kleinveldt. Australia seam bowler Copeland could potentially join for the start of the county campaign, while all-rounder White is being lined up for the FL T20. However, South Africa paceman Kleinveldt will not be arriving. Chief executive David Smith told BBC Northampton: "We withdrew the contract offer on the basis that we've given him a considerable period of time." He continued: "It was complicated by the IPL [Indian Premier League] and his desire to keep both options open." With 29-year-old Kleinveldt, who has played three Tests for the Springboks, out of the picture, the club have revived their interest in recruiting Copeland as their overseas bowler. The 26-year-old right-armer from New South Wales made three Test appearances in 2011, but appears to be an outsider to make the Australian squad for this summer's Ashes series in England. "Trent initially didn't want to come to the UK this summer, but he has since had a change of heart," said Smith. White, 29, represented Northants in last season's T20, averaging 57 from eight innings. Smith had hoped to persuade Mike Hussey to return for a second spell with the club, but admits that may not happen. 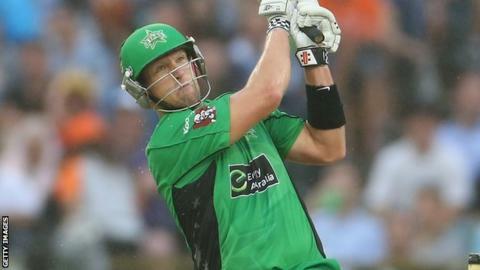 "Cameron did a really good job for us last year in T20 and has expressed an interest in coming back," he added. "That's something we're exploring at the moment, just in case the Mike Hussey situation doesn't come to fruition."